In my opinion, three elements combine to make a great short story. First, meeting the challenge of creating a compelling tale using as few words as possible. Second, well-developed characters. I have enjoyed many stories with twist endings, but a well-drawn, complex protagonist is what really keeps me reading. Third, the short story is wildly adaptable to a variety of styles, and so can be more experimental. A reader will go along with something written in second person, or from an insane person’s point of view, whereas the reader might not commit to something like that in novel length. As a writer, I’ll take risks in short fiction I might hesitate to take in a novel. I am an avid reader of Alfred Hitchcock Mystery Magazine, and am honored to have a story appearing in the December 2015 issue, which goes on sale in October. The sun rises, the birds start singing, and I have to get up. Morning is my most productive writing time. I work a day job as an environmental tech, so I try to wake around five am and write for an hour before heading to work. I enjoy an extra large mug of coffee first thing in the morning. I’m not a coffee connoisseur, and dose it liberally with non-dairy creamer. After lunchtime, I have to cut back on caffeine, unless I’m facing a deadline, external or self-imposed. I thrive on those super long days, dosed to the gills on caffeine, writing until I drop. Love it. But I can only do that on an as-needed basis before my body insists it is time for regular sleep cycles. According to Goodreads, I read 36 books last year, so three books a month. That doesn’t count individual short stories. I do read in my genre while I’m writing, which doesn’t seem to throw me off. I read a smattering of non-fiction, and other genres. I enjoyed the non-fiction book Finding Zero by Amir Aczel, a mathematician hunting for the earliest image of a zero. I had somehow never read William Kent Krueger. This spring I read Ordinary Grace, and I’m hooked. I can see why Mr. Krueger is winning awards. I met Cathy Ace at Malice Domestic 2014, and became a fan of her amateur sleuth mysteries. Her protagonist is a middle-aged Welsh-Canadian woman with an idetic memory. Great fun, and great settings. I met Ovidia Yu at Bouchercon 2014. I read the second Auntie Lee novel, and became an instant fan of these amateur sleuth mysteries set in Singapore with a protagonist that reminds me a little bit of Mrs. Pollifax. I read Blood, Ash, and Bone by Tina Whittle, and very much enjoyed this action-packed novel about a female gun shop owner. I like my characters, and I hate to make them suffer. However, that suffering is what makes a compelling story. I write a rough draft that is often lukewarm, then during rewrites and edits, I create more obstacles, tension, and pain. I write amateur sleuth fiction, which reliably comes to a positive conclusion. Someone once accused me of writing yet another good conquers evil story. I gladly accept that criticism. I believe people read mysteries because real life all too often fails to deliver a satisfactory conclusion, or a comeuppance for the bad guys and gals. To really be satisfying, the fictional characters need to go through the wringer first. I have to remind myself that my protagonists will survive their ordeals, and then really dog-pile the travails on them. I am incredibly grateful to people I meet who say “I’m only a reader.” Only? Never say those words! Readers are the people who make my writing meaningful. And don’t forget – all writers are readers, too! As for why I write, I can’t imagine not writing fiction. Why would you not choose to create your own worlds, and populate them with people telling the story you invented? Writing fiction is my way of making sense of this crazy life. I had a “what if” moment. My imagination dreamed up a body buried under the leaves. That image stuck with me for a couple years before it worked into a story. I first tried writing a short story, but it wouldn’t gel. 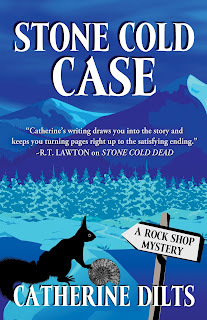 The idea bloomed for Stone Cold Case, the second novel in my Rock Shop Mystery series. The body is not found in a hunting blind exactly, but the blue tarp and the body became vital to the story. Laura DiSilverio told me to read ten mysteries of the type I was attempting to write. I was to treat it like a college literature class, examining key points about each novel. I kept a notebook, jotting down the setting, on which page the first body appeared, the characters, murder weapon, and all manner of details in an attempt to dissect what worked and what didn’t. The exercise was time consuming, at times tedious, and a little painful. By the end, I had learned my genre inside and out. I also learned a lot about that elusive quality of voice, and how word choice, pacing, sentence length, and character develop unique voices. Rock shop owner Morgan Iverson’s discovery of human remains reopens a sixteen-year-old cold case and unhealed wounds in a Colorado mountain town, while her find of a rare gemstone sparks a dangerous treasure hunt. A Sasquatch look-alike may hold the key to both a prom queen’s death and the location of the gemstone. As she begins to uncover the past, Morgan becomes the target of someone determined to keep the truth buried. In book two of the Rock Shop Mystery series, amateur sleuth Morgan Iverson digs into gemstone prospecting to solve a Stone Cold Case. Catherine -- we share that rising early in the morning gene (and the enmity of those who do not like folks who are chipper before 10 a.m.) and our love of Tina Whittle's books. I was thrilled when Tina blurbed my latest, Ant Farm. Good morning Jim! I'll be heading to the day job soon. Yes, people can get cranky when you enjoy greeting the rising sun. Thank you for inviting me to your blog. Great post. Caffeinated to the gills. I know that feeling! Hi Mario! I'll bet you do know the feeling. You've been busy! Nice interview! I totally agree about the motivation of readers. Hi Becky! I have met folks at the Bouchercon and Malice Domestic conferences who have said, "I'm only a reader." I tell them none of us would be here without readers! Catherine, I couldn't agree more with your undertaking to read and analyze the type of fiction you want to write. When I finish a book I like, I'll go back and try to figure out how the author set up the clever denouement, or created the suspense. (I'm a Cathy Ace admirer too.) Best of sales for Stone Cold Case! Thank you, Allan. My breakthrough moment was when I realized I put more effort into researching, writing, and editing college papers than I did writing fiction. Super interview, Catherine, and thank you so much for giving my work a shout-out. Much appreciated! And the advice you received about reading widely in your chosen genre? Absolutely spot on! Cathy, I knew a woman years ago who decided to make some quick money writing a romance novel when she did not read the genre. Needless to say, her project failed, and she gained respect for authors of romance novels. Gems, old bodies, and Sasquatch. Sounds lovely! I also have found other mystery writers kind and generous. Nice interview! Thank you, Kaye. Jim asks such interesting questions. Thank you, Kristina! Yes, I can't escape the need to quantify results. That's what I love about Goodreads. They track your numbers for you.